Flying north from Coolangatta over all Gold Coast Beaches, past Surfers Paradise, to Seaworld. Your message returns south following the Pacific Highway to Point danger. We then fly north again for a second circuit past all of the Gold Coast Beaches. Two complete circuits of the Gold Coast in each two hour flight. Writes your message across the Sky. In addition, An optional double back is available on each northbound run past the beaches at Surfers Paradise. This involves the aircraft turning back from Main Beach traveling south to the Q1 then turning North again. 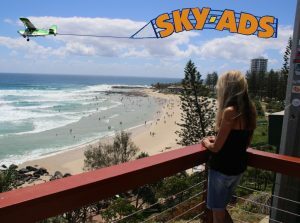 Banner Towing missions from Coolangatta on the Gold Coast right up to Coolum on the Sunshine Coast are possible with our amazing little airplane. Starting here on the Gold Coast, we fly past all the Gold Coast beaches. then continue North, covering the Brisbane Bayside suburbs, past the airport, along the Gateway road to the Bruce Highway. Continuing to Caloundra for a run past the Sunshine Coast Beaches all the way to Coolum. Additional Optional: Return run via the Bruce Highway past Caboolture and the Brisbane Northern and Western suburbs. Past the CBD, we then follow the M1 to Mount Gravatt, Beenleigh and eventually back to base. Our service is a 3 hour flight. It Starts here on the Gold Coast. Your message floats past all the crowded Gold Coast beaches. We then continue North following the M1, which is usually a car park, all the way to the CBD. We then turn South covering the Western suburbs past Southbank. Finally we continue back to the Gold coast again via the M1 past Mount Gravatt then Beenleigh and eventually back to base. This flight cover the majority of the population in south east Queensland. Commencing at the Caloundra Airport we fly past the Sunshine Coast’s beaches all the way to Coolum. Your message returns to the bottom of the coast, following the Sunshine Motorway. Therefore the people on the western side of the Sunshine Coast can read your message. Tracking north again from Caloundra we repeat the first lap again. Further this flight can be extended to cover Noosa on one of the legs.